Rick Fernandes is currently in the process of relocating with his wife and two children from New York to Latrobe, Pennsylvania. The new director of the Fred Rogers Center at Saint Vincent College took over in January for the retiring Rita Catalano. The Center, which opened in 2003 and gained a $14 million campus HQ in 2008, focuses on the positive potential of children’s TV programming. 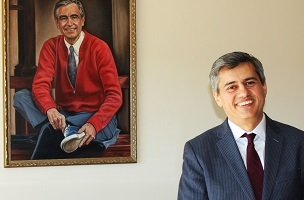 Fernandes began his career as an apprentice on Sesame Street and has since worked for other PBS shows as well as The Disney Channel, Nickelodeon and Turner International.